Beauty begins with health. In order to be healthy and nutrition as well as we should be selective in cosmetic products. Unfortunately, in the market today the most acclaimed cosmetics are synthetic and toxic substances. Our skin is the largest organ of our body and it can not distinguish the harmful substances in cosmetics that you use. Chemicals can easily spread all over the body by penetrating the skin and the bloodstream.. When the toxic chemicals penetrate the skin, they irritate our body and cause allergies, acne, inflammation, also can lead to the formation of cancer. Cosmetics laden with toxic substances, can damage the body's hormonal balance. Also these chemicals cover the skin and prevents the body to detoxify from the toxins. Used in facial cleaners, shampoos and bath foams. It is a substance that deplete the skin. This oil-based substances, contains carcinogenic substances such as dioxane, ethylene oxide and astedaldehid. Almost every cosmetic products contains paraben. It used as a preservative to extend the shelf life of the product. Because of the evidence that paraben is concentrated in the breast cancer tumors , it is not used America and Europe widely. Talc powder is found in powders, eye shadows, blushers, bronzers, lip balms, baby powders. Studies have shown that this substance causes cancer. It is found in the moisturizers, sunscreens, eye creams, cleansers, bronzers, eye shadows, brushes, lip balms ,eye makeup remover and acne treatment products. Silicon canlead to clogging of the pores. Because it is obtained from the wool, chemicals used in this wool can impair lanonil. It is known to clog the pores of the skin and cause acne. The use of these chemicals in cosmetic sector is cheaper than the use of the ingredients contain less harmful chemicals. 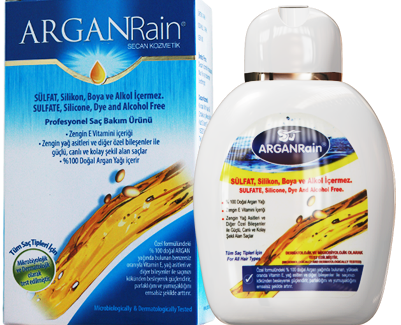 If you do not want to risk your life, you can trust ArganRain products. ArganRain Shampoo does not contain Silicon,Paraben,Sulfate or Alcohol! !